Need a Hangar in the Bay Area? Contact Us! Premium Hangars in the San Francisco Bay Area! Office Available for Rent! Click Here! Hayward Hangars, LLC owns and operates a general aviation airplane hangar project in a prime location at​ Hayward Executive Airport (HWD). Building B has 18 42' x 34' box hangars. We expect to start construction of Building A, with six 50' x 40' and six 50' x 50' box hangars, later this year. Each hangar unit has electric bi-fold doors, ample lighting, three-phase power, and fire sprinkler protection. Tenants enjoy access to private lavatories and parking. The project is within walking distance of Home Depot, the airport administration building, the La Quinta Inn, several restaurants, and a shopping center. HWD is one of the leading general aviation airports in the Bay Area. It is located 25 miles southeast of San Francisco, 26 miles north of San Jose, and 14 miles south of Oakland. HWD is a controlled field with a localizer system, and has two parallel runways, one of which is 5,694 feet long. The airport has two vendors of jet fuel and aviation gas, an aircraft wash rack, and several providers of aircraft maintenance services. There is a self-service aviation gas fuel farm. The management of Hayward Hangars successfully operated a hangar project in Southern California for 16 years, and the design team and general contractor have considerable experience in the planning and construction of airplane hangars. Hangar units in each of the three categories are available for sale or lease. For more information, please feel free to contact us. 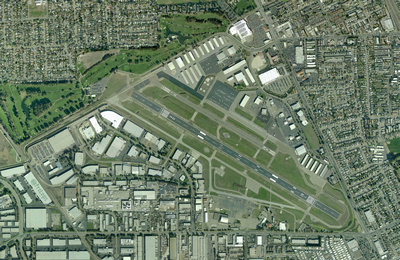 Get more information on Hayward Executive Airport.